Jim Bentley was pleased to finally get his man after making Lee Molyneux his second summer signing. The former Accrington winger has signed a two-year deal after his short-term contract with relegated Tranmere expired. Bentley admitted in January he wanted to sign the 26-year-old before he moved to Prenton Park and was pleased to beat off competition from other clubs to land his signature. The Shrimps boss said: “He’s a player who I’ve liked for a long time. “I think he’s technically very good, mobile, ambitious, wants to do well and can play in all the forward positions. “I think he’s got goals in him and assists too. He ticks a lot of boxes, is eager to come here and wants to get started. 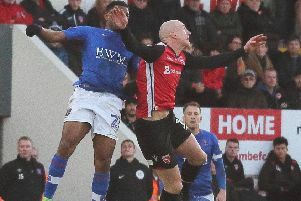 Bentley believes Molyneux is a man who can get goals from midfield, something that was lacking last season, as the former Everton youngster looks to settle again after his move from Crewe to Accrington didn’t work out. He said: “He’s did extremely well in his season at Accrington, scored plenty of goals and created plenty of goals. “He got his move to Crewe in League 1 but for one reason or anther it hasn’t happened for him. “He’s a had a loan spell at Rochdale, he’s gone back to Accrington and got six in 15 or something like that. “Anyone who can chip in with goals from midfield is worth their weight in gold and he’s proved he can do that. The Shrimps boss is also confident that Molyneux, along with fellow new boy Tom Barkhuizen, will bring much-needed pace and balance to his side. Bentley said: “If anything we were a bit lob-sided last year and we’re just trying to get the balance and the chemistry right. “We wanted a little bit more pace in the side too which we’ve got with the two signings we’ve made. “They’re both eager, have both played at a higher level, are both good ages and love the game. “Tom Barkhuizen can play right, left or centre and Molly’s the same. Bentley has now signed two new faces having earmarked six as the magic number this summer. It comes after the Shrimps boss released eight players at the end of their deals – captain Mark Hughes, Padraig Amond, Andy Wright, Ryan Williams, Jack Sampson, Will Bell, Declan Watson and Marcus Marshall.